Faith Christian head pastor Stephen M. Hall, right, has refused to respond to allegations that his church caused harm. The University Religious Council passed out these fliers at the UA to warn incoming freshmen about Faith Christian. The University Religious Council at the UA recently added a sixth warning sign to this list. The change was aimed specifically at Faith Christian Church, a council official said. A Tucson ministry described as a cult by more than 20 former members and employees is homeless. Faith Christian Church, which recruits converts on the University of Arizona campus, recently walked away from its longtime meeting place at Amphitheater High School after the school district investigated its practices. Amphitheater Public Schools is not releasing the results of its investigation, saying the information is confidential and that its release “has the potential to create legal issues for the district that can be costly for our taxpayers,” district Board President Deanna Day wrote in an email to the Star. District general counsel Todd Jaeger, who oversaw the investigation and advised the board against releasing the results, said the church chose to stop meeting at the high school when its lease expired rather than seek a renewal as it has in years past. A UA investigation — which focused only on Faith Christian’s campus-based student groups, not on the church itself — found no violations of school rules, Dean of Students Kendal Washington White said. Even so, three UA employees who are advisers to the student groups recently were required to take part in a cult-awareness workshop, White said. UA spokesman Chris Sigurdson said the church’s student clubs also “are on active monitoring status this year,” which will include unannounced spot checks at their meetings and events. The Arizona Daily Star first reported in March on allegations against Faith Christian by 21 former members and staffers, as well as nine parents of UA alumni. They said the church promotes spanking of infants as young as 8 weeks old and exerts excessive control over the lives and finances of its members. Some said they suffer from post-traumatic stress disorder because of their church experiences. In April, the Star reported that six current and former Amphi High employees had concerns about the church’s presence at the high school. Five said the setup caused problems when Amphi High’s principal, a longtime member of Faith Christian, allowed the church to bend the rules of its lease agreement to the detriment of students. Amphi attorney Jaeger said in April that the district was investigating but wouldn’t say what the inquiry would cover. “We don’t discuss pending investigations,” he said at the time. Now that the investigation is over, Jaeger won’t disclose the results, citing attorney-client privilege. “The investigation documentation, and legal counsel’s recommendation derived therefrom, constitutes attorney work product and is therefore not subject to disclosure, as it is privileged from the same under law,” he said in an email to the Star. Phoenix attorney Dan Barr, whose practice specializes in public-records law, said the district likely has a legal right to withhold the investigative documentation. But he said there’s nothing in state law to prevent the district from providing taxpayers with an overview of the results. 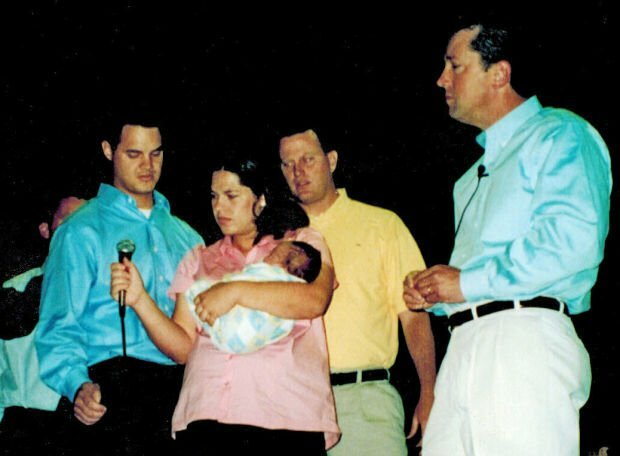 Former church members interviewed by Amphi’s investigator told the Star his questions focused heavily on the church’s reported promotion of corporal punishment, particularly of infants and toddlers. “I got the impression (the investigator) was trying to find out whether this was something the church was advocating while they were meeting on school property,” said Lisa Phillips of Mesa, who joined in 1994 and spent 12 years working at the Tucson church and two of its satellite churches in the U.S. and New Zealand. The positions she held included associate pastor and campus minister, and she once recruited church members at the UA. Phillips shared with the Star copies of emails in which the Amphi investigator acknowledged receiving and listening to Hall’s talk. At least 10 of Hall’s family members are on staff at the church, the Star’s investigations have found. Church officials have declined since February to respond to any of the public allegations about their practices. That also was the case last week when the Star called the homes of five of the church’s pastors. Only one, associate pastor Geoff Scara, answered the phone. “No comment,” he said. Amphi’s probe does not appear to have addressed complaints about Amphi High Principal Jonathan Lansa, whose conduct was the subject of the Star’s April investigation. Five current and former faculty members accused Lansa, a longtime member and corporate director of the church, of holding prayer meetings during work hours and of allowing his church to move school equipment that Amphi students would spend class time moving back. Reached last week by the Star, two of those people said they were not contacted by the district as part of its investigation. Lansa, who declined to comment on the allegations in April because of the district’s pending investigation, did not respond last week to two emails and a phone message left on his administrative assistant’s voicemail. Amphi’s Governing Board renewed Lansa’s $93,000-a-year principal’s contract on April 21, four days before the Star published its story. At the UA, students arriving for classes next month will face mixed messages from UA administration and from the University Religious Council, an independent entity that is not under UA control. The church’s three affiliated student groups — Wildcats for Christ, Native Nations in Christ and the Providence Club — were reapproved for another year of official UA recognition on April 29. White, the dean of students, said the UA determined the church-related clubs had not broken any of the rules set out in the Student Code of Conduct. The UA has authority only over the student clubs, not the church itself. But at the same time, the campus religious council has stepped up its warnings to UA students about the church and its student clubs. The council, a coalition of the ministers and directors of religious and spiritual groups at the UA, voted unanimously in late March to strip the church of council membership. More recently, the council distributed hundreds of fliers at freshman orientation events to alert newcomers to the church’s tactics, said council member Michelle Blumenberg. Last school year, the council published a list of five warning signs of religious deception or abuse. For the new school year, it added a sixth warning about “religious manipulation.” The change was specifically aimed at the Faith Christian recruiting technique former members described as “love-bombing” — showering new students with attention and affection to win them over, Blumenberg said. Religious manipulation includes “strategies that target vulnerable students, methods that seek to break down and rebuild students, and instances of over-the-top niceness used as a form of entrapment,” the council’s new warning list says. White said three UA employees who are members of the church — associate pediatrics professor Dr. Chan Lowe, Dr. Aaron Leetch, an assistant professor of emergency medicine and pediatrics, and Amanda Cheromiah, recently hired to work in student affairs and enrollment management — were required to attend a workshop on cult dynamics in May because each serves as an adviser to one of the church’s student clubs. The church’s last Sunday service at Amphi High was July 5. Its lease expired the week before that, but the district allowed a short extension so the church could seek new quarters, said Jaeger, the Amphi school district’s attorney. So far, the church has not found a permanent location. Church officials recently approached the Tucson campus of Arizona State Schools for the Deaf and the Blind for information about renting space there, but those talks went no further, said school spokesman Ryan Ducharme. Phillips, the ex-church employee recently interviewed for the Amphi investigation, said she called the Marriott on Friday and was told the church had booked space to meet there again this morning. Faith Christian’s website lists a phone number people can call to find out where services will be held each week, but calls to that number do not disclose the location. Instead, callers must leave their names and numbers and are told someone will call them back. Phillips said when she worked for the church, detailed information about location changes was included on a recorded message for any callers to hear. Contact Carol Ann Alaimo at calaimo@tucson.com or 573-4138. UA officials investigating Faith Christian Church following complaints from parent. 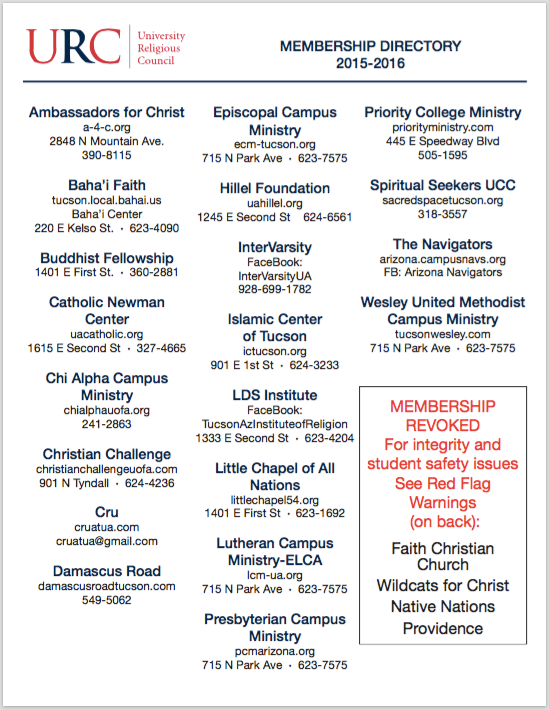 University of Arizona dean's office keeps an eye on clubs linked to Faith Christian. Affiliate of Faith Christian Church in Tucson recruits at University of New Mexico. But leaders of Tempe's Hope Christian Church say they've put authoritative ways behind them.